MSG to NSF Converter is an impeccable software to export multiple Outlook MSG files to Lotus Notes. This tool brings forth various features to execute the entire process of conversion in a trouble free manner. Moreover, it can be accessed in any of the versions of Windows. 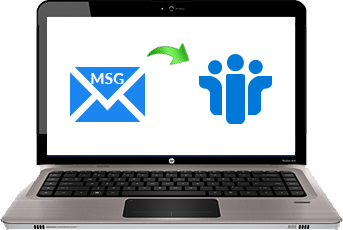 MSG to NSF Converter permits users to convert Microsoft Outlook MSG files to IBM Notes. It has the capability to transfer all the MSG files in batch. The entire process can be done in a quick manner with the help of this application. Users need to install the program on the system and then choose the MSG folder that needs to be migrated. With this proficient utility, it is possible to export more than folder from MSG to Lotus Notes. There is an option of Add Folder available in the panel of the tool. Once users hit on this, they can add any number of folders and perform conversion. Moreover, they can eliminate the added folder, if required, via “Remove” button. Most of the users face difficulties to access the data after the migration. 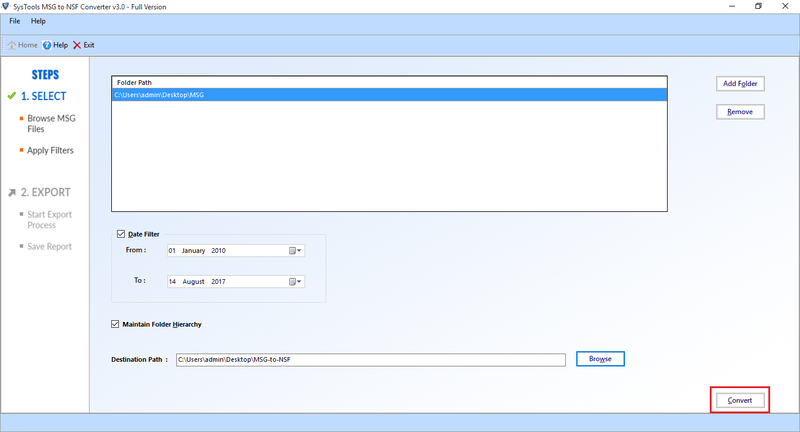 To handle out this situation, there is an option to “Maintain Folder Structure.” Users need to mark this and after completion of the procedure, they get the same structure of the folder. This is an optional option and therefore, does not necessary to check. MSG to NSF Exporter comes up with one more advance feature. By using this, users can migrate only those emails, which are important. 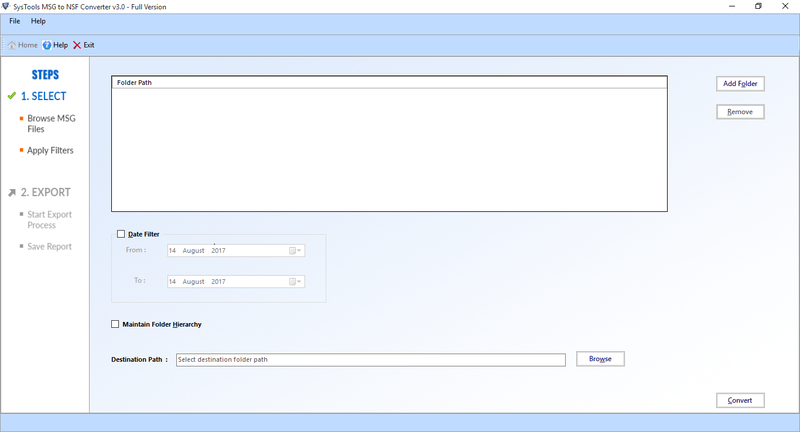 In order to do this, they need to choose the Date Filter option and then type in “From” and “To” column. All the emails falling under that date range will appear and users can proceed to conversion. The tool needs the installation of IBM or Lotus Notes 8.5 and 9.0.1 editions to achieve the task of moving Outlook MSG to Lotus Notes NSF. In addition, it has a user interactive interface therefore; even a novice can access the tool without any difficulty. It does not require any technical knowledge. As soon as you click on Export, the procedure of begins by the utility. 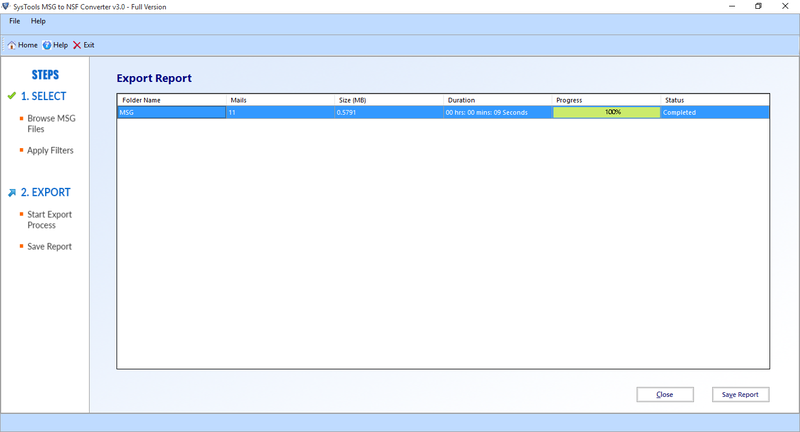 The tool displays a progress report and finally the completion report. This report can be saved in any of the location as per user’s choice in CSV format. Moreover, it proves to be helpful for future purposes. Last week, I was looking for a method to convert MSG files to NSF format and fortunately I got this software, MSG to NSF Converter. Within some few clicks, I have executed the entire task. Believe me, this is really a superb program for the executing the migration. Import MSG into NSF format was not an easy task to perform. However, with this utility, it becomes one of the simplest works to do. I want to say a big thank you to the whole team of developers sincerely. Their hard work is clearly seen in the way they have designed the product. Microsoft Outlook is one of the major platforms for accessing the data and performing instant emailing. On the other hand, Lotus Notes is another email application that is gaining popularity in an immense manner. It is associated with Domino Server and stores the data in NSF format. In some scenarios, users wish to move MSG files into NSF. This is due to various reasons like; MSG is the file format that cannot be accessed in any other email client except Outlook. Therefore, if users wish to access it in Lotus Notes then, they have to perform the migration procedure. Another reason is that, MSG is a vulnerable file format and can be damaged easily, as result many users switches from MSG to NSF. Lotus Notes provides the facility to keep the file encrypted, this is helpful as it protects the message from the authorized access. Now, because all of these mentioned reasons, the conversion from MSG to Lotus Notes NSF is needed. However, it is not so easy to find a relevant product for the accomplishment of the task. This is here, MSG to NSF Converter helps all users. Why We Need MSG to NSF Converter Only? Among all the modern and highly technical utilities, MSG to Lotus Notes Converter is one the best product. This is because it brings forth various features that help users to migrate multiple MSG files to NSF format without any inconvenience. It keeps the data safe and protected. This means ensures that no data loss takes place. In addition, it also preserves folder hierarchy and provides date filter option.